This week, Kathy is chatting with our dear friends Shannon and Jason Mullett-Bowlsby – also known as the Shibaguyz! 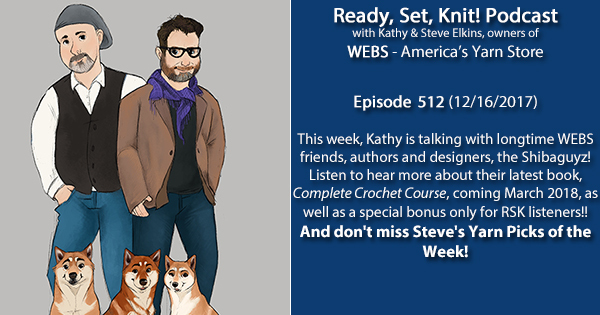 Shannon and Jason are knitting and crochet designers who have a new book coming out this March called: Complete Crochet Course: The Ultimate Crochet Guide! Shannon and Jason have some exciting news – in addition to a new book, they’ll be at Stitches West and United in 2018! Oh, but wait – they’ll also be teaching at WEBS in the Fall of 2018! Listen to hear more about the Shibaguyz and their new book! To learn more about Shannon and Jason, click here! 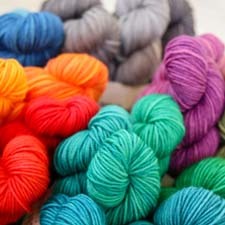 ..And as an added bonus only for RSK listeners, Shannon and Jason are offering 20% off of their Stitches West and Stitches United classes, as well as 20% off of their limited edition Stitchip collections! The offer is only good until midnight on December 23rd – this Saturday!! – so click HERE to find out more! TOMORROW is our last Sunday opening of 2017! WEBS will be closed Christmas Eve, Sunday, December 24th, and New Year’s Eve, Sunday, December 31st. Plan your shopping trips to Northampton accordingly! This entry was posted on Saturday, December 16th, 2017 at 7:39 am	and is filed under Authors & Designers, Classes, Ready, Set, Knit Podcast. You can follow any responses to this entry through the RSS 2.0 feed. You can skip to the end and leave a response. Pinging is currently not allowed.